Dimensions: Approx :12.4X4.4X14.8CM / 4.88"X1.73"X5.83"
Press the "on" and hold it for 5 seconds can turn on or turn off the inside blue light. Charging indicator light: red means charging; green means fully charged. Please No Need to Take Off the Battery Insulation Film Before Using. As the different production order, the appearance color of battery may be blue .Except the battery color, other all is the same as the pictures, please rest assured to choose. If you are interested in our items,please add it to your cart. ❤ Three-speed design provides you more choices in different temperature environment. ❤ The built-in blue light and the side emergency light can be very useful after you turn off the lights in the night or when you are camping in the summer. ❤ The charging cable is the same as Android phone USB cable. 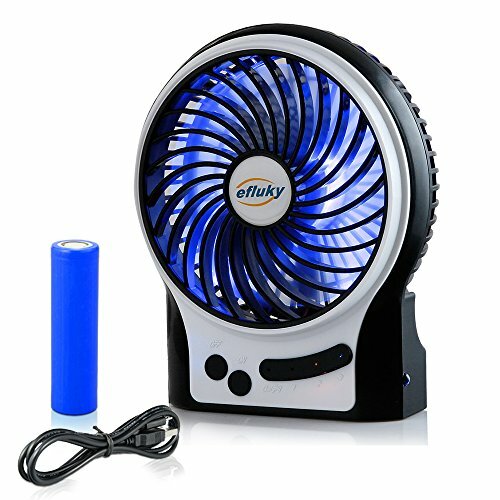 You can use or charge the fan with your smartphone charger or plug into your computer USB interface. ❤ Multi-usage scenario：You can use this in your office or at home with the power from computers. You can also bring this portable fan for travelling in summer to help you cool down when it is hot outside. ❤ Come with a 30-day money back and a 12-month limited seller's guarantee against manufacturer defects from date of purchase, and 24 hours' friendly customer service! If you have any questions about this product by efluky, contact us by completing and submitting the form below. If you are looking for a specif part number, please include it with your message.